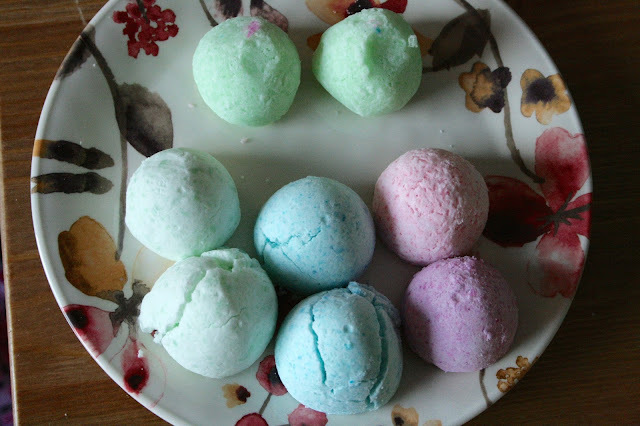 Last Sunday, I finally got the chance to cross something off of my "to-make" list: homemade bath bombs. Gathering family members who wanted to join me and all of the supplies, we took over a large dining room table and sent the boys and little Bug outside to play. It was really fun setting up the dining room table. We placed all the ingredients, all of the measuring cups, bowls, and spoons we needed, and went to town. 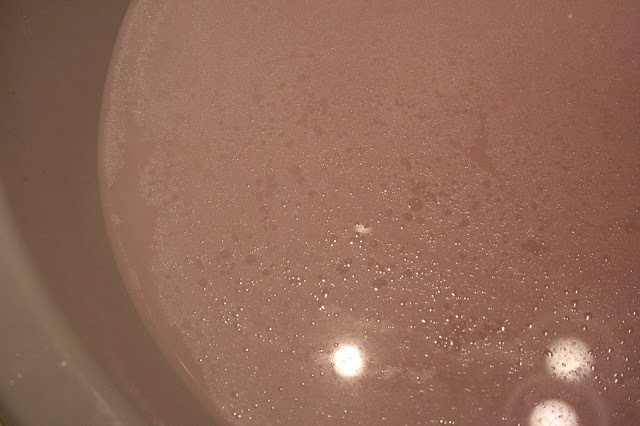 Figuring out how much cream of tarter we needed instead of citric acid (you need less) we followed this video and started our first batch of bath bombs. 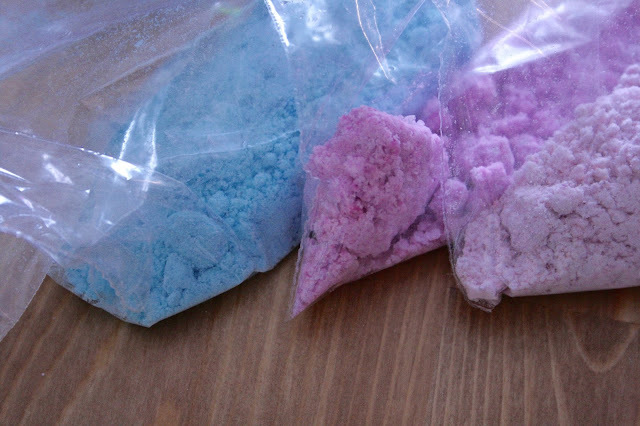 We used Young Living Essential Oils* for our smells, food colouring to make it look pretty, and plastic Easter egg molds to hold it all together. Pictures of the chaos of the dining room table. After we finished putting the mixture into the molds, we placed them into the refrigerator to set. Then we made another batch using the citric acid, going through the same steps, placing them into molds, and put them in the fridge in a separate container from the first. Then we watched Bridesmaids, ate Parsnip Chips (From Costco!! SO GOOD), and did a puzzle. We probably left the bath bombs in the fridge for almost two hours before we took them out of the plastic egg molds. The first citric acid bath bomb I took out of the mold. We started with our first batch. Right away I knew that they didn't work very well. Taking them out of the molds, they broke in two, the middle being very crumbly. The ends did stay together though, yet they were still on the fragile side. 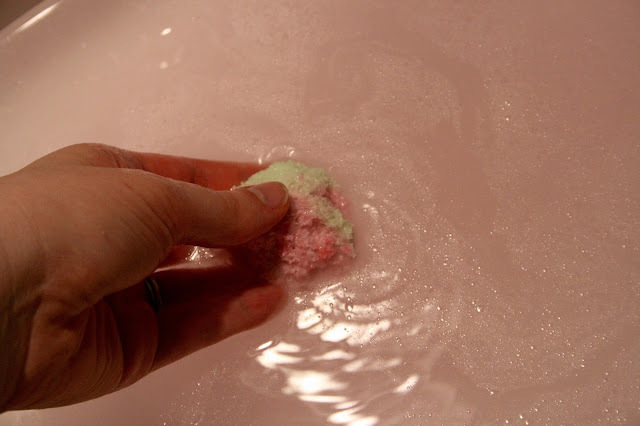 There were also a few bath bombs that fell apart as soon as we took them out of the molds. The ones we made with citric acid also broke in two (except for one! but of course, I forgot to take a picture of it), however, I did find that the two sides didn't crumble at all and felt much stronger. 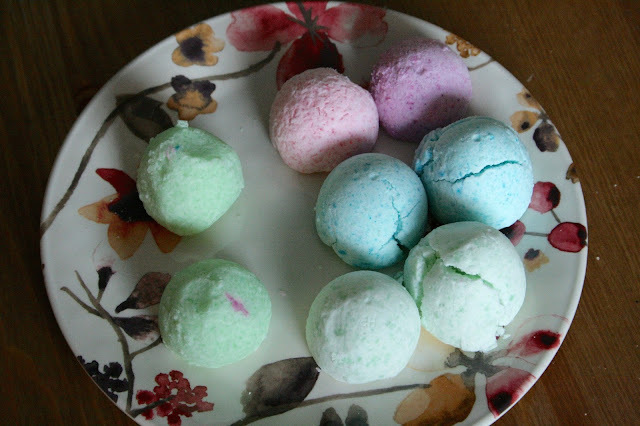 The green bath bombs on the top were made with the citric acid. They are solid and strong. 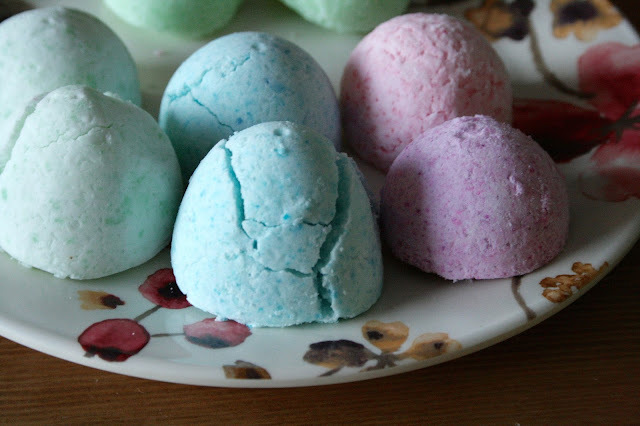 The bath bombs made from cream of tarter are easily squished. This morning I decided I wanted to test them out to see if there was a difference in how they fizzed in the water. 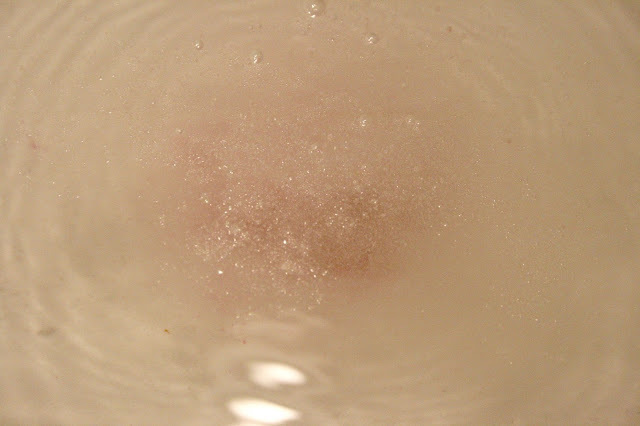 I found that the bath bombs made from cream of tarter created a very nice milky texture in the water without much fizz at all. 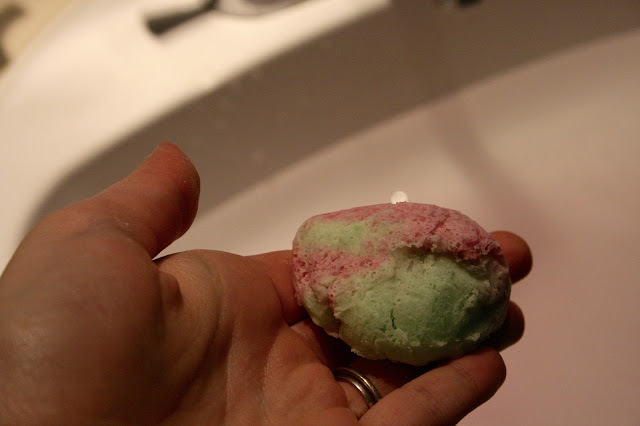 The following three pictures are of a bath bomb I made with citric acid, which dissolved and fizzed very satisfactory. It was very oily though, which was surprising since I only added a couple of drops of oil in the first place. Perhaps it was the combination of the caster oil and essential oils. 1. Play around with the amount of oils. 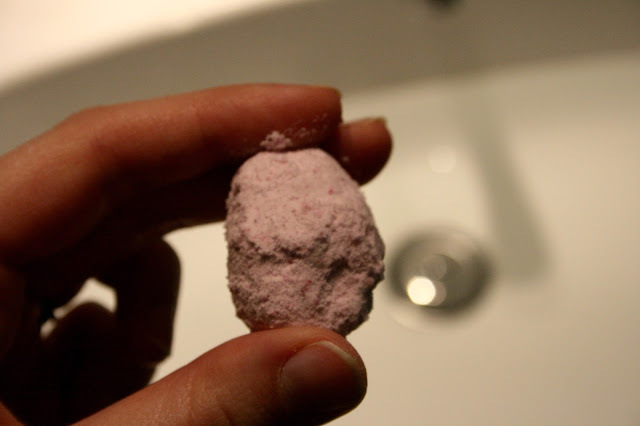 Even though I only used a couple of drops of essential oils for the recipe, I found that the bath bombs left a very oily residue in the water. An oily bath is perfect for a great day of pampering, I think, but not for every day use. I did have to rinse out the tub afterwards. Maybe if I used a different combination of castor vs essential it would be less oily. 2. Try packing the cream of tarter ones into the molds harder than I did before - just to see if it was my newbie technique that made a difference in the strength of the bath bomb or if it was the cream of tarter itself. 3. Leave them overnight. It did say to leave in the fridge for 30 mins or overnight on the counter, but I would definitely like to try to leave it for a longer period to see if the cream of tarter ones needed longer to set. 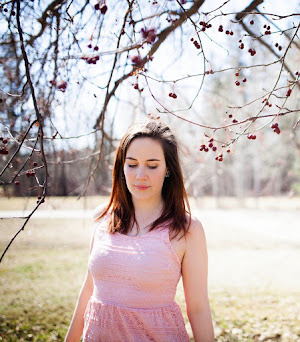 All in all, I had a great afternoon spent with family, and we have awesome smelling bath products even if the majority of them ended up more like bath salts than bath bombs. I will be making them again!! 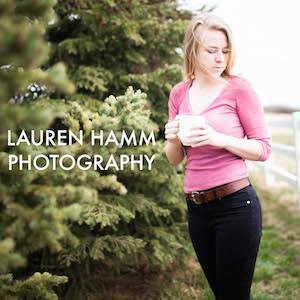 *We used only a couple of drops of the Young Living Oils because of how pure they were. The recipe called for 1 TBSP and I made the conscious choice that that was way too much. Considering how oily the bath bombs were, I am so glad I didn't add more.